The Diocesan Evangelisation Team, with the help of Mmedia Design, have recently produced a series of leaflets which can be used in a variety of ways in a parish. "I have read these leaflets and cards with interest and pleasure. They are particularly welcome as we come to the end of our Year of Faith and will help us to further our faith journey. "I can see many uses for them in a parish: they could form the basis for an RCIA course or help parishioners to reach out to others with confidence because they contain clearly but attractively, the teaching of the church. "Above all, they could be invaluable for those times of pastoral concern when for example, parents come seeking Baptism for their children or at times like funerals when the church may be full of people who don’t see the point, but would welcome a leaflet of explanation or a card of comfort. 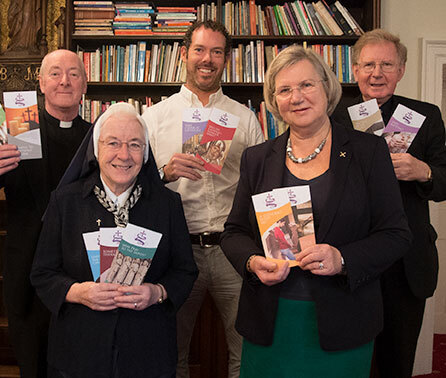 "For these reasons I heartily recommend them for your parish and look forward to further resources from the Evangelisation Team."